The 100% online VT Master of Information Technology is preparing IT professionals to meet today's--and tomorrow's-- emerging technology challenges. Areas of study include cybersecurity, big data, business analytics and software development. Ranked #1 online IT program for veterans by US News & World Report; #2 program overall nationwide. Contact us at vtmit@vt.edu. Two Virginia Tech online graduate education programs are among the top in the country. The university’s online master’s degree in information technology is the nation’s second best, according to the 2018 U.S. News & World Report’s ranking of the Best Online Programs. This is the fifth consecutive year that the program, the top among Virginia universities, landed at No. 2 in this annual ranking. It tied New York University for the No. 2 spot, behind the University of Southern California. U.S News also ranked Virginia Tech’s online graduate engineering program at No. 20. The report assessed 1,490 online degree programs and evaluated select features, including student engagement, faculty credentials and training, peer reputation, student services and technology, and admissions selectivity. It considered only degree-granting programs offering 100 percent online classes. The graduate information technology program enrolls 549 students. Enhancements to the program have been some of the keys to its success in the past few years, said Pamplin Dean Robert Sumichrast. “Pamplin and engineering have improved the curriculum and student experience for the MIT [master of information technology] over the past four years by using top educators and addressing the needs of our professional students with an updated and expanded curriculum in areas such as cyber and healthcare analytics,” he said. The program represents an important joint effort between the two colleges, said Glenda Scales, who is associate dean for global engagement, chief technology officer, and director of engineering online programs at Virginia Tech. 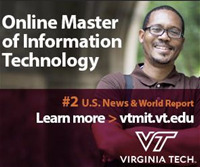 U.S. News also ranked Virginia Tech's master of information technology program as the No. 1 Best Online Graduate Information Technology Programs for Veterans. Additionally, the program picked up a national accolade from Cyberdegrees.org, which recently ranked it No. 6 among cyber security programs. As for online graduate engineering programs, Virginia Tech’s was second among Virginia schools, according to the U.S. News report. It ranked ahead of programs at several other state institutions, including Old Dominion University at No. 42 and George Mason University at No. 57. It also landed higher than programs offered by the University of Florida and Ohio State University, according to the report. There are 2,277 graduate students enrolled in the College of Engineering for its 2017-2018 academic year. The college offers a variety of graduate programs online or through interactive videoconferencing, including aerospace engineering, ocean engineering, and civil engineering. Pamplin enrolls 1,025 graduate students, including Ph.D., MBA, and specialized master’s programs. Virginia Tech has offered online and distance-learning education for two decades. Its first online program was available in 1997. Numerous graduate degree or certificate programs are available. Visit Virginia Tech Online for more information. Understand the systemic nature of cyber threats and develop strategies for dealing with them through law and policy. Meet our Program Director at Booth #678 and learn more about Virginia Tech’s online MIT program--ranked #2 nationwide; #1 for veterans. The VT-MIT degree is offered jointly by the Virginia Tech College of Engineering and the Pamplin College of Business.